We are still without our video camera, but the good news is the aperture controls are once again working perfectly on our SLR system. (See our special mahalo to Ikelite.) It is clear that even if things go well next week, we will have gone without video documentation for half the summer. As non-scientists who rely heavily on video to give us credibility, the loss of this camera is especially disruptive. Last week, we reported sighting a turtle that we had documented at Old Airport Beach while we were diving there in 1994. This week, here at Honokowai, we sighted the only other Old Airport turtle we logged that year. So--of the two Airport turtles we saw on a 1994 dive, this year we resighted both upcurrent at our dive site. Unlike its more fortunate friend, this second Old Airport turtle has developed tumors since we last saw it. A dear friend--a youngster actually--and a turtle we have sighted each year since 1994 showed up this week. Last year, we reported that Hoahele had developed full blown tumors in each eye, and one on her left flipper the size of a Kennedy half dollar. This week, we resighted Hoahele. She was in no mood or condition for a reunion. We got close enough for an excellent photograph but unfortunately, the shutter hadn't been advanced to the next frame. We therefore lost not only a great photo opportunity, but also the definitive identification that a left profile would bring. Still, the turtle was unmistakeably Hoahele. Both eye tumors are now worse and most shockingly, her left flipper tumor has now ballooned to the size of a medium-sized orange. This is the way of fibropapilloma. It manages to affect the youngest turtles the most. This week we resighted another turtle. There is no mistaking the profiles that we matched from a tumored animal from last summer. When looking at the photos, one would marvel at how well the turtle has done. The eye tumors have regressed and superficially it looks like she won her personal war against fibropapilloma--until she gets up to swim. The turtle now is a pitiful sight--her front left and rear right flippers apparently paralyzed and hanging uselessly, while the other two flippers struggle to pull her along. We have swimming wounded here: turtles who appear to have survived their bout with fibropapillomas but wear lasting scars. 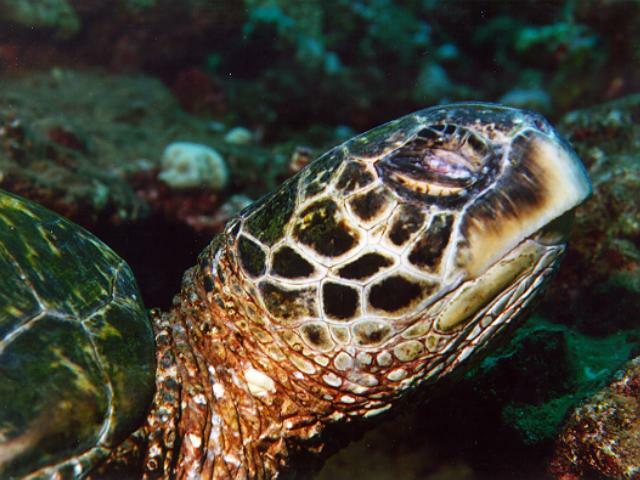 At Honokowai we have several one-eyed turtles--eyes eaten away from FP disease, now just useless slits. These turtles have already learned to adapt. At Honokowai we have several one-eyed turtles--eyes eaten away from FP disease, now just useless slits. It is challenging to photograph these turtles from their non-seeing side. As you circle, the turtle does a slow turn, always keeping the remaining eye on you. It is not that the turtle is frightened. It is merely curious or cautious, and has learned to view its world putting its good eye forward. Yet these turtles are still the lucky ones. Another friend we have known since 1991, Turtle 91-10, lost both her eyes to fibropapilloma disease. She has been completely blind for two years now. We have yet to sight her this summer, however, and we worry about her. She was always a regular visitor to the Turtle House every summer all the way back to 1991 when she showed only the earliest sign of the disease. The last two days have been like going through the rinse cycle of an automatic washer. The full moon has brought its predictable extremes in tides, mixed with a brutal current that pulls at tendons and makes photography a miserable enterprise. The last two days have also brought swells that make coming back to shore more exciting than we would like. On such days it takes a special stupidity to dive, and even the turtles prefer to stay home resting in their pukas. Today, however, Saturday July 19th, we were rewarded for braving the poor visibility, the current, and the swells. For three years we have spotted a very large tagged female with a ridiculously torn right rear flipper. It looked like she’d lowered it into a paper shredder, hence the name. Every attempt we ever made to read Shredder’s tags failed miserably--until today. This grand dame was preoccupied satisfying a major itch on her plastron. One of us stayed well away where she could see while the other sneaked up quietly from behind. This strategy worked. When Shredder finally became aware of a strange presence she lifted to leave. Oddly, instead of swimming directly away and downcurrent, she was instead rather curious and did a slow graceful circle. This allowed us to read a second tag and more importantly, to photograph her right profile. We report that Shredder, tag numbers A 240 and A 241, is a Honokowai turtle and has been for at least three years. We add her to our growing list of tagged adult females who make our dive site their permanent home. Best of all, Shredder appears to be healthy.